On seeing that our semi-final opponent in the Copa del Rey was Almeria I imagine that there were quite a few of us who remembered our 0-8 win at the end of November and thought “this should be easy enough”. The league table shows our rival in the relegation zone on a measly 17 points but there has been a fair bit of improvement recently. Juanma Lillo was sacked as Almeria’s coach after our demolition job and his replacement Jose Luis Oltra is beginning to get results. The first sign was a 1-3 league victory at Sevilla in December and in recent weeks they have knocked Real Sociedad, Mallorca and Deportivo out of the Copa. The cup run has been particularly impressive as they have won all six legs so far, scoring 17 goals. They seem to be improving too; in their last four games (Liga and Copa) they have won three and drawn the other at home to Real Madrid. The odds are still with Barça but if we judge by our games so far in this season’s cup run it will probably not be so straightforward. Fortunately, we know that Pep Guardiola will give the game the best possible preparation and we can be sure the team will give everything. The big question again comes down to how much rotation he will make. One thing is taking a game seriously but Guardiola has to look at the bigger picture of the season as a whole. After tomorrow night’s game we have a league trip to Hercules on Saturday followed by the return semi final game in Almeria next Wednesday (Feb 2) and then we have the visit to Camp Nou of Atletico Madrid the following weekend (Feb 5/6). Guardiola knows that if he wants to get the best from his players there are some who need to take a break every now and then. Some players just cannot keep to peak performance level if they are asked to play 60 games a year. It’s a complicated business and we have seen how our performance has dropped in the Copa games when we weren’t at full strength. I understand the thing about playing your second choice keeper in the cup, fair enough, but besides that I don’t think we should have more than a couple of changes. For tomorrow’s game Puyol is out with a knee problem and Bojan is a doubt with stomach pains, but on the plus side Alves could be fit enough to return. Marc Bartra, Martin Montoya and Nolito have trained with the first team this week and therefore are in with a chance of being included in the final match squad which has still not been announced. Puyol could be replaced by Milito though he didn’t look too fit against Betis last week, or we could see Eric Abidal continue at centre half. Eric has been shutting mouths quite a while now but his current form is excellent including when he plays in the middle where his speed is so useful for those last ditch interceptions. Barça: Pinto; Adriano, Piqué, Abidal, Maxwell; Xavi, Mascherano, Iniesta; Pedro, Messi, Villa. Almeria: Esteban; Macedo, Pellerano, Carlos García, Jakobsen; Mbami, Corona, Vargas, Crusat; Piatti, Ulloa. This entry was posted in Copa Del Rey, Eric Abidal, Match Previews, Xavi Hernandez and tagged Almeria, Barça, Barcelona, Copa, Football, Sport. Bookmark the permalink. 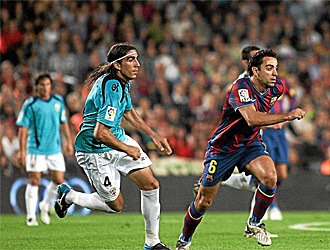 Has anyone heard an update on Xavi’s tendonitis? If he is suffering still this may be a game to see him bench-out significant minutes. Nic, I’m one of the people who Abidal has been shutting up with his superb performances week in week out. Just to clarify the basis of my viewpoint again. First of all I don’t believe in putting your starting XI player out of position. Granted in case of injuries/suspensions you might have to bring in the player for a game or two but then what exactly is the point of having subs/backups for every position in the squad if you have to keep on playing one of your best players out of position on a frequent basis. Doesn’t this mean that Pep has little confidence in both the backups [Milito] and youth team prospects [Muniesa,Bartra, Fontas]. Milito might need more time to recover full fitness but these youngsters are not going to get any better sitting on the bench or playing for Barca’s second string. They will make mistakes but thats how they are going to learn and improve. So IMO they should at least be tried in the Copa fixtures. Either play them or send a few on loan where they can get the required experience. Moreover with Milito possibly leaving in the summer, I hope our scouts are doing some work in identifying transfer targets for the CB position. Finally while Abidal might be wowing us with his performances at CB, aren’t we running the risk of Abidal and/or Milito [first choice and backup LB] picking up a knock/suspension due to the extra workload. @Omer – yes, I have had similar thoughts but the following link provides some interesting views on our defensive situation – namely that Pep is planning to make Abidal Puyol’s eventual replacement as first choice centre back. Interesting and believable. Thanks for the link Roger. An interesting angle on the defensive dilemma at Barca. While I agree that Abidal with his pace and experience can be moulded into a top notch CB over time, however expecting any defender to replicate what Puyol does for Barca is very,very difficult if not impossible. 1) If this is the case then Barca will need to identify a potential successor to Abidal the LB who IMO is one of if not the best in that position in the world. Even if Maxwell is to be elevated to the LB role, Barca will need to acquire a backup LB. Adriano could also be eased into the role although we don’t have backup at RB either. Kieran Gibbs/Diego Contento/ Fabio Coentrao anyone? 2) The financial mess is purely Barca mgt. bungling at its worst. Plus Barca could have offloaded Caceres, Henrique and K9 over the summer/in the current transfer window to generate the funds to get a decent CB. I don’t even want to get into the issue about the ridiculous amounts we paid for Ibra and Chygry. 3) If Abidal is going to partner Pique in the near future, there’s only going to be room for 1 or 2 from the trio of Bartra,Fontas and Muniesa. So why not send the one least likely to make it on a loan spell to a club where they can experience first team action on a regular basis. Who knows we might get a pleasant surprise similar to Pique. I b’lieve Coach Pep has all his cards held close to his chest and how to perfectly deal them shouldn’t be a problem to him. That said, it is indeed noteworthy that our array of fixtures for the next 4 weeks is quite taskin’ and will require massive joules of energy — the luxury of which I suppose we have — to fly high in all. However, since our style of play does not involve the random runnin’ around all over the pitch chasin’ nothin’, there shouldn’t be any qualms with the fixtures even if we field the same set of players in all, as it might even help them to attain more magical fluidity, rhythm and form. After all, Real Madrid have been usin’ THE SAME set of players to win all the matches they’ve won so far this season and if anythin’, this has helped them to blend even more. Of course, there must be some decisive and incisive rotations and as I’ve put it above, Coach Pep knows just how best to deal his cards. First of all I want to tell you that your doing a wonderful job with the blog. I have been reading it for about a month now and have enjoyed your detailed posts. I think Pep is going to play the first leg with most of the regular starters. With puyol out its always scary. I for one would like to see him throw in Sergio and Mach as they have done before with Eric and pique adding the extra Cushin and either Maxwell or let fontas come in and get another chance. Let’s see some affelley!!! Great job agin on the blog and if you ever need any help with the design of the blog I own a web development company and could donate some time to the blog if your interested ( at least a graphic in the header). Hey, nice to have you here. In case you don’t know it yet, this blog is the continuation of our FCBNews blog. My guess is that Pep will start with our best 11. Win the match big, so that the return leg will not be so difficult. Just like the tie with Betis. Some regular starters then would get some rest . Goooo Barca, a manita is not impossible.!! Very glad to have you here Jfan101 and thanks for the very kind offer – I’ll ask the more IT literate members of the group to get in touch with you to follow up as I’m more the writing than the technical end. Hope you enjoyed the match tonight – five wonderful goals! I still vividly remember the mess Sergio Busquets made in last season’s CL semi final in Milan vs inter, which costed us the whole tournament but I bet he’s a better player now. The team has officially been announced and it is just as I predicted in the preview: Pinto; Adriano, Piqué, Abidal, Maxwell; Xavi, Mascherano, Iniesta; Pedro, Messi, Villa. Well it wasn’t eight, but at another manita can’t be sniffed at. Thought Adriano and Mascherano had their best games yet. Abidal had a GREAT game.